I go to the Latin Mass. I haven’t always – it’s been a year at least, or probably more, since I left behind the “Novus Ordo” Mass introduced by Pope Paul VI in 1969, before I was born. And I have never been so at peace, so full of joy in my Catholic Faith and, more specifically, in my regular experience of prayer and worship. My family converted to Catholicism when I was seven years old, just in time for me to receive First Holy Communion with the other first graders. My mom was a vibrant convert and shared our new faith eagerly with my siblings and I. I recall the allure and mystery of late nights with mom, praying rosaries by candle light. I recall the respect she taught me when visiting convents or monasteries. I recall the echoes of chants in various abbeys. I recall my simple, childlike observation of the various forms of liturgy to which mom exposed us. While we were always parishioners at Novus Ordo parishes (the most reverent or “traditional” ones we could find), mom would often find a Latin Mass or Byzantine Liturgy within driving distance and take us to visit. So while I didn’t grow up with a regular exposure to the older rites, it was occasional and always accompanied with respect and appreciation. If I had to describe my adolescent perception of the Latin Mass and the other liturgies of yesteryears, it would be akin to seeing a magnificent piece of art hanging in a museum. It was lovely and I liked looking at it, even being drawn in by it, but it stayed at the museum where one could visit from time to time. I never really considered that it might be a regular — or even, central — part of my worship of God. Somehow, I just accepted that while the oldest liturgies of the Catholic Church were unarguably more beautiful, more reverent, more worthy of an All Loving God, for some reason we just do things differently now. I grew older. Life and its journey caused me to invest more intentionally into my Faith. My relationship with Christ and His Holy Church became more important to me, and the simplicities of my childhood began to be thrust into the light. I became like a child who, recognizing her parents’ continued love for her, also begins to recognize their shortcomings – and through that knowledge, matures into a fuller understanding of the true shape of things. In these years of personal growth, I saw clearly that not all Catholic parishes are created equal. That is why, as children, we would follow mom from one site to another while she sought out the most orthodox celebration of the Eucharist she could find. I have clear memories of the many “trial” parishes, and sadly, of some of the more grievous offenses committed in them. Even as a young girl, I saw these differences between the various parishes. And as I grew, I saw that these differences could even be found within a single parish; the 8:00am Mass might be vastly different from the 10:00am, depending on who was celebrating or what choir was in rotation or what parishioners gravitated toward that mass. Everything depended on external and material circumstances; everything was hit or miss. And I began to see that it was frequently miss. I sometimes struggled with the Catholic invitation to a New Evangelization, recognizing that it might involve inviting someone to Mass… If I found the world’s most Sacred Treasure ensconced in kitchy pseudo-art and liturgical music sounding like a Disney score, offered by ministers who half-joke their way through the rite and preach little of real substance, in the presence of a congregation that is largely tuned-out or plugged in (maybe they’re all following the readings on their devices? ), how could I ever explain to my non-Catholic guest: “Look, this really is a divine mystery… just trust me, it’s a lot more special than it appears”? Some years passed in this way. I left home for college and found that this game of hit-or-miss was present even at vibrantly Catholic universities. When I graduated, married, and began a family, the experience continued. Going to Mass remained something of a strategic feat of triangulating all the factors that would hopefully add up to a decently prayerful act of worship. But if you calculated wrong, if you weren’t able to line up the flashing light on the jackpot, you would find yourself in a Mass with that too-often ache in your chest as you wondered if this was really the best we had to offer Our Lord. Often, the thought was in the back of my mind: Why would Christ have instituted something that can be so easily botched? As my husband and I continued having children, our desires in the Life of Christ became more focused: above all, we want to raise Saints. But as our fervor deepened alongside our love of these children springing up around us, our experience of the Sacraments grew worse: not only did it become more difficult to “line up” a moderately reverent celebration of Mass that focused on Jesus’ Eucharistic Presence rather than a funny, catchy, usually-semi-heretical homily as the “main dish,” but it grew increasingly discouraging to find so many priests declining to teach the Truth. In the many attacks on Holy Mother Church today, why is it almost impossible to find a shepherd who speaks out boldly, promoting the Truth of Christ and exhorting his flock to authentic holiness? Driving home from these liturgical landslides time after time, we found ourselves feeling frustrated and disconnected…. And then ashamed for feeling that way, because isn’t this the Holy Mass, the greatest of all prayers, the prayer given to us by Christ Himself? Sunday afternoons were filled with burdened thoughts and irritated conversations, wishing that Mass that morning had been a more worthy – or at the very least, a less offensive – offering. We flirted with a Latin Mass parish for some time, braving the hour-long drive with squawking toddlers and struggling to be fully present at the sacred mysteries (often out of earshot in the narthex). 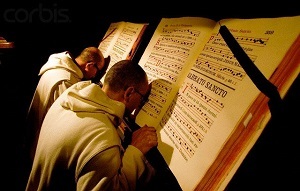 While we loved it and had such consolation from worshipping there (despite the squawkers), it still took a few more depressed Sunday-aftermaths at Novus Ordo parishes to finally make us commit to that long drive and the tackling of a daunting new missal. And then it came: the deluge of the Glory of Christ. This is what I had been missing all those years. The first lesson that struck me after leaving the Novus Ordo for the “Extraordinary Form” is that the Mass doesn’t depend on us. Yes, we are invited into actual participation, but this is primarily an interior one – for the Mass is fundamentally something done by and for God Himself, and given to us as a gift, not something that we fabricate ourselves. That is to say, it is something so much bigger than us, and we are so much littler than it. Noting this contrast begs the question: If we have the option of giving something to God that is “fool-proof” in its worthiness – a Mass that is the organic fruit of dogmatic decrees, Popes and Saints, and the prayer of the Church spanning centuries – as opposed to an “option-rich” missal crafted by committee in the 1960’s and 70’s, why would we not choose the former? Again, this is an act of highest worship for God, not for us. I’m convinced that this is why even the most reverently celebrated, externally splendid Novus Ordo Mass cannot compare to the dignity of even a private (mostly silent) low Mass in the traditional form – this has certainly been my experience. Moreover, it is in this regular, committed devotion to the right worship of God in the Latin Mass, in a context of right relationship to Him, that I have experienced the most profound interior freedom. Since making this transition to the Latin Mass that is at once a “return to the roots” and a “journey to the heights,” my clarity of thought and prayer has increased profoundly; my desires and my purpose are more defined, more sure than at any other time in my life; my yearning for virtue in every form is magnified; my inner peace and joy is as a child again, because I have come to such greater understanding of who I am before my Father. The Mass is the constant into which we are invited to enter, the stillpoint of the turning world; it is the constancy of the Father’s love for us, made manifest through the ages and presented in this highest form for our participation. As a mother whose sole concern is for the sanctification of my family, I choose to give to my children this constant, this immovable, timeless mystery through which every other mother of Saints has ushered her children from birth unto glory. I am not a theologian or a Saint. I am not even a veteran mother; my days are full to bursting with crayons and messes and giggles and diapers. I am quite young. But I can write with a joyful assurance of the fruits found in the right worship of God: Never have I experienced such consolation in my Catholic roots. But the Novus Ordo is totally valid! I don’t understand all that Latin, and even if I did, I can’t hear it anyway! I don’t feel like I have a place or a role in the old Mass! I’ve been attending my parish for x years, how could I change now? The Latin Mass just isn’t for me – it’s an aesthetics thing. But that’s just it, fellow pilgrims: The Mass is not “for us.” It is for Him. And when we love someone, we want to give them the very best. I love my husband deeply, and while I could make him a bowl of cereal for dinner and it would “count” as dinner, I don’t. I do my very best to make him a tasty, nutritious meal. Why? Because it’s not about doing the bare minimum. It’s not about doing what “counts” or what’s “valid.” It’s not about “enough” – with God, it is never enough. It’s about offering to God the very highest form of worship we possibly can. If we have this option, why do anything less? As a newcomer to these heavenly treasures, my reflections cannot claim the form of a philosophical treatise or even a rant of righteous indignation. I simply see now that the Latin Mass is for everyone, the heritage of all Catholics and very life-pulse of the Church, not a secret reserved for scholars, mystics, or antiquarians. In the Old Testament, the prophet Haggai calls upon a “remnant” of people who must ascend to the mountaintop and rebuild the temple. My friends, the offering of Holy Mass by the Church Universal is the most important thing any of us will participate in during our lives. And if even a majority of Catholics will not respond to the call to make this the central reality of our lives and the very highest and noblest offering we can — the Mass of the Ages, the form offered and fundamentally unchanged in the Church for fourteen centuries — then let us together join that remnant who will do so, and ascend.